To upgrade to a major version of any of our product, click the Upgrade button on the homepage of that product and fill in your email address with which you purchased an old version to get a discount. If we find your email address in our records for purchase of the old version, we will send you to a discount page to purchase the upgrade. When you purchase New Softwares.net products, you are entitled to minor product version updates and bug fixes for free. Minor updates refer to updates of product versions where first version number has not changed. For instance – if you buy version 6.x.x, you can upgrade to any other version 6.x.x free of charge. Major upgrades refer to a product version change reflected by a change in the product version number. For example, an upgrade from 6.x.x to 7.0.0 is a major upgrade. Major upgrades usually have significant amounts of improvements to product features and includes the introduction of new features. To take advantage of a major update or version upgrade, you will be required to pay full fee of the new product. 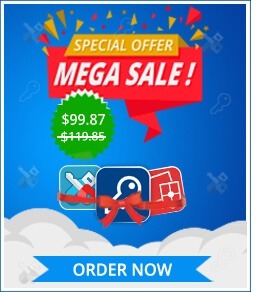 If you are an existing New Softwares.net customer for the customer or a new customer, when it comes to major upgrade, you will need to purchase the product for the normal price. For example, if you are an existing customer and have Folder Lock 6.5 installed on your PC, then you pay full when upgrading to the latest version i.e. Folder Lock 7. The notes below detail some things you might want to be aware of with regard to compatibility between Folder Lock v7 and the earlier versions of the application. Volume file format has been changed to support the new features and to increase security. Folder Lock v7 can fully read and write all file formats from the previous Folder Lock versions. Use the following for some ideas for this section. Folder Lock v7 software supports password resets of Lockers created with version 7 however, password resets of Lockers created with old version is not supported. If you have a volume created with, for example, Folder Lock v6.5.5, and you start to work with it using Folder Lock v7, and then open the volume with v6.5.5, and yet again with Folder Lock v7 again – New Softwares.net will warn you that it has detected unauthorized changes to the volume’s file header. This is okay as Folder Lock v7 performs some new integrity tests which the previous versions cannot synchronize. The important factor is that, even when you get an unauthorized changes to the volume’s file header prompt (mentioned in the scenario above), the volume data is fine. This scenario only happens when switching back and forth between versions of software using the same volume. Discontinued Customer Support for the trial version of Folder Lock versions up to 6.5.5. All product upgrades are provided at a discounted rate to ALL existing New Softwares.net customers, subject to the following terms. Once upgraded to a new product version, you may download the new version and install on top of the prior installation. There is no need to uninstall your original copy of New Softwares.net products, but it is always advisable to do so for a clean installation of the new files. Discounted upgrades are for major version upgrades ONLY. Furthermore, the discounted upgrade policy is only for upgrades of similar products. That is, YOU MAY NOT request for a discounted upgrade of one product against a different existing product installed on your computer.